VATICAN CITY (CNS) — U.N. leader Ban Ki-moon and some climate scientists are banking on Pope Francis to be a unifying moral force to get the world onboard in the fight against global warming. Pope Benedict XVI, who has been lauded as the “green pope” for his attention to taking care of creation, “made some amazingly helpful statements on the environment” during his eight-year pontificate, said Veerabhadran Ramanathan, who helped discover in the 1970s that pollutants and other gases, in addition to carbon dioxide, were contributing to the greenhouse effect. Ban has been hoping to tap into that global reach with his invitation to the pope to address the U.N. General Assembly in New York Sept. 25 and by calling on religious leaders to work with governments and science on climate change. The U.N. secretary-general spoke at the Vatican April 28 at an international gathering on the moral dimensions of climate change and sustainable development. 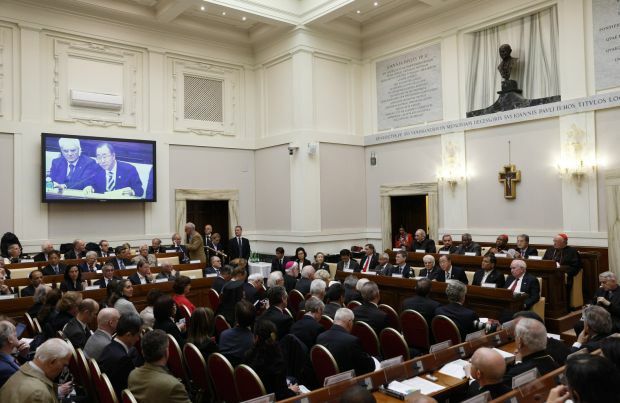 The “summit” was sponsored by the Pontifical Academy of Sciences, the Pontifical Academy of Social Sciences, the Sustainable Development Solutions Network and Religions for Peace. Ban and experts promoting a united global response to global warming believe policies, regulations, new technologies and cost incentives are not going to be enough to get industrialized nations to radically reduce their carbon footprint. “We have to change our attitude toward each other and our attitude toward nature. So it has gone beyond the grasp of science and beyond the grasp of leaders of nations. It is now in the hands of religious leaders,” said Ramanathan, who attended the Vatican summit as a member of the Pontifical Academy of Sciences. That’s a message the Catholic Church and popes have been saying for decades. Pope Francis’ stance, like his predecessors, always has been a moral one. The church doesn’t propose or endorse specific policies or programs, but it lays out the Gospel vision to guide citizens and policymakers so they will respond to problems more ethically. The pope’s much-expected encyclical on the environment, in fact, will not be a white paper about capping carbon emissions, but a pastoral plea to cap greed and short-term gains at the expense of the planet and other people. But his outspoken criticism against “an economy that kills” and “negligence and inaction” in response to climate change has critics worried the pope is straying beyond his spiritual role. The Chicago-based Heartland Institute, which advocates free-market policies, brought a delegation to Rome to tell reporters that Pope Francis should not be “lending his moral authority to the politicized,” and what they consider “unscientific,” agenda of the United Nations. Christopher Monckton, a British political adviser who was part of the delegation, told reporters that “it is not the business of the church to stray from faith and morals” and wander into “the playground” of policy. Cardinal Peter Turkson, who helped draw up the first draft the pope’s encyclical, told reporters during the Vatican climate summit that the church wasn’t there to confirm or deny what science is saying about climate change. “But bishops on the Pacific islands tell us” how much of the land “is now under seawater. Is that not a concern?” asked the cardinal, who is head of the Pontifical Council for Justice and Peace. “We cannot confirm the data” being presented by some of the world’s top scientists, he said, “but we can say how human life is supported” or not by policies based on science. As clergy, “we went to the seminary to save souls,” he said, but it is also important “we look at the garden where these souls live” and what should be done to care, cultivate and pass it on to future generations. Other members of the Heartland delegation objected to the Vatican cooperating with organizations and individuals who promote population control in ways that clearly violate church teaching. Cardinal Turkson responded by saying “the Second Vatican Council invited us to a new way to minister to the world,” as imperfect and sinful as it may be, by finding common ground and working with others whenever possible to serve humanity. Rather than religion losing its soul by opening its doors to global policymakers and experts, Ban’s call for religious leaders to remind people of their “sacred duty” to care for people’s dignity and nature indicates they are looking for a soul mate in religion.